Tolquhon Castle, Ellon is a well preserved though ruinous Scottish castle which is now owned and maintained by Historic Scotland. Members can visit for free and other visitors are welcome. There is a small entry fee to non Historic Scotland members. There are no organised guided tours at Tolquhon Castle near Ellon and visitors can make their way through the various points of the castle. A guide book is available to buy from the castle shop where several members of Historic Scotland staff are available to answer any questions. Before we take you on a virtual tour of the castle here is a brief history of Tolquhon Castle which was a noble residence for the Lords of Tolquhon for over 500 years. The building that can be seen now was built from 1584 to 1590 by the seventh Lord of Tolquhon, William Forbes, where he lived with his wife Elizabeth Gordon. It was built as a castle of beauty and good living rather than a defensive castle. Though he did have built four bronze guns that were inscribed with the family motto of Salus per Christum. One of these are on display on the far wall in the visitor centre. Prior to this William Forbes was brought up in the Preston's Tower which was used as a dwelling home for the Forbes family for over a century. 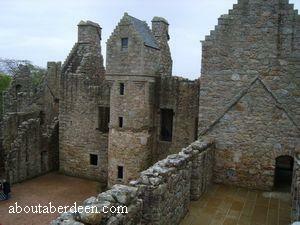 The first Forbes to own the castle was Sir John Forbes in 1420. 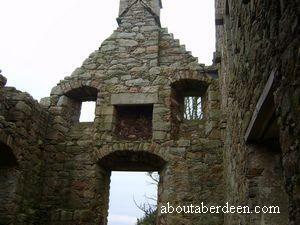 Prior to this the building was a principal seat of the ancient Thanage of Formartine held by the Prestons. Sir Henry Preston died without a male heir and his Thanage was divided between his daughters husbands. One was Marjorie, the wife of Sir John Forbes and Sir Henry Preston's second daughter. 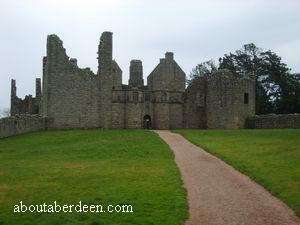 William Forbes inherited the castle from his father who died at the Battle of Pinkie at East Lothian in 1547. 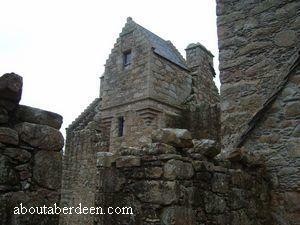 William was a generous Lord and he founded and endowed a hospital in the nearby village of Tarves. Upon completion of Tolquhon Castle he had work started on a memorial to his wife and himself at the parish Kirk of Tarvis on the south aisle. William Forbes only enjoyed his home for a short time because he died in 1596. He and his wife are buried at nearby Tarves Kirkyard. The Kirk no longer survives but their tomb does in the graveyard and this Tomb of Tarves is maintained and preserved by Historic Scotland. It has a portrait statuette of Elizabeth Gordon of Lesmoir and her husband William Forbes. 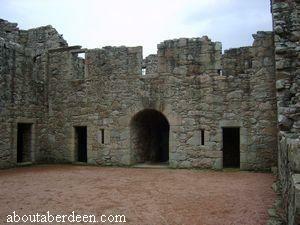 Upon his death Tolquhon Castle passed into the ownership of his son who was also called William. Other notable heirs included Alexander Forbes, the tenth Laird or Lord, who was a Colonel serving King Charles II in a cavalry regiment. He saved the King's life in the Battle of Worcester in 1651 when the King's horse was shot and the King was injured. Alexander Forbes ordered his soldiers to form defensive positions around the King whilst he took him upon his horse and away from the battlefield. The King knighted Alexander Forbes for his bravery. Sadly Alexander Forbes was not as clever with his money as he was in battle and he invested in the Darien Scheme which tried to overcome the economic hardships of Scotland by investing and establishing a colony on the Isthmus of Panama so that trade could start with the Far East.  The Company of Scotland raised funds for this venture from private subscriptions from investors like Alexander Forbes. Unfortunately the settlers found farming there difficult and locals and English colonies would not trade. Many of the settlers died from fever and those that did survive returned to Scotland. Investors lost their money and fell into debt. Alexander Forbes lost so much money that by 1716 the estate had to be sold to the Earl of Aberdeen. 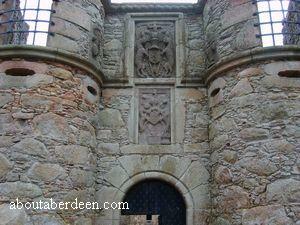 However the castle itself was not sold because the eleventh Laird, William Forbes, desired to keep the family seat. In the first Jacobite Uprising he was wounded by Redcoats and turned out of the castle on the 5 September 1718. The estate became farmland and Tolquhon Castle fell into disrepair. 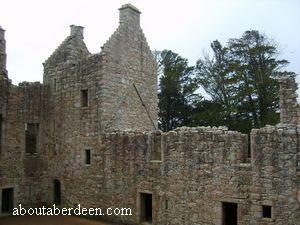 In 1929 the last owner of Tolquhon Castle was the Earl of Haddo who transferred ownership of the ruins into state care. Much of the 1584 Tolquhon Castle building still exists though no longer has a roof and some brick work has crumbled away. Visitors can still see the original format of four ranges grouped around an inner courtyard during their tour of Tolquhon Castle. 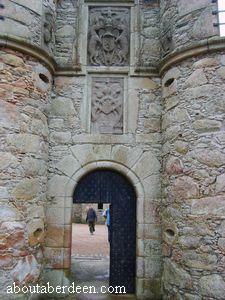 Entry to Tolquhon Castle is via the small visitor centre which has toilets and a small shop. 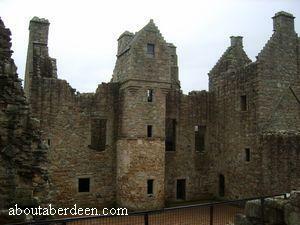 There is no catering facilities at Tolquhon Castle but there are many fine restaurants and take-aways at the nearby town of Ellon such as the Casa Salvatore Italian Restaurant which opens for morning snacks, lunches and dinners. The visitor centre leads through to the grassed and path area of the outer court which gives a great view of the front of Tolquhon Castle and is a great area to take photographs of Tolquhon Castle. 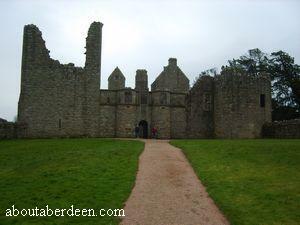 A short walk takes you through the main gate and gatehouse and into the castle's inner courtyard. Though do look up before entering the castle to see the armorial panels of the Forbes family coat of arms and that of King James VI who visited Tolquhon Castle just after its completion. William Forbes was his tenant in chief. On the right is a portrait statuette figure of Sir William Forbes. Al This Warke excep the Avold Tovr was Begvn be William Forbes 15 Aprile 1584 and Endit be him 20 October 1859 which translates to All this work except the old tower was begun by William Forbes 15 April 1584 and ended by him on the 20th October 1859. To the left is the Preston's Tower which is nicknamed the Auld Tour. 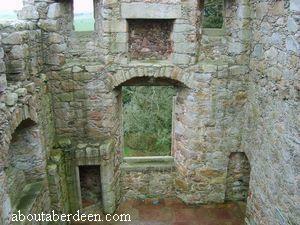 This is the oldest part of the castle and is thought to date back to the 15th century to about the year 1420. This tower house may have been built by Sir Henry Forbes or his son in law Sir John Forbes to live in with his wife Marjorie Forbes. Preston's Tower can be accessed up a flight of stone steps. It would originally have been a four storey building with a battlemented roof. This original building would have been built with defence in mind and had walls of 3 metre thickness. 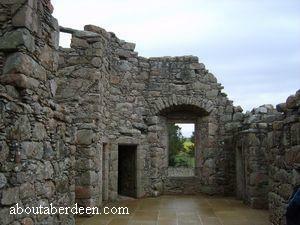 Beyond this, sticking to the left, are the kitchens and large stone ovens which were known as the East Range. Like most people of the time the stable diet would have been bread and this was baked here in the bakehouse. The domestic servants would have lived in the rooms above. The Lairds supper would be supplemented with a variety of meat and this included pigeon or dove from the Pigeon House which was known as the Doocot. 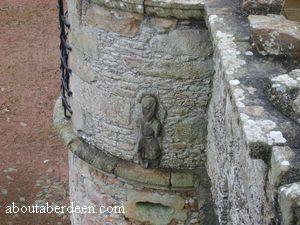 The remains of this can be seen on the left as you walk to the castle. 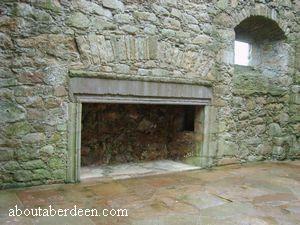 Honey would be made from the bee hives located in the pleasance wall of the West Range. These hives were called Skeps and were in form of bee boles which are better suited for the wet and windy weather of Aberdeenshire. Between the Preston's Tower and the East Range is the 6 metre deep well which would have been the main water supply for the castle. This can be safely looked down as it is now covered with a metal grill. 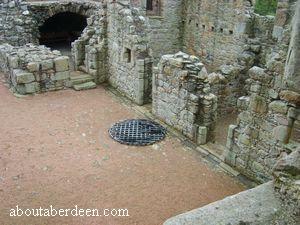 The castle's pit prison was located by a hatch from the bake house. To the right and in the middle of the castle is the area that would have been the accommodation of the Lairds and their families. This includes a great hall with flagged stone flooring and fine examples of the large stoned fireplaces and a private chamber with paved hexagonal sandstone flags which were interlocked with smaller stone squares. The top floor would have been the library in which the Forbes held a large collection of books. Some are now kept at the Aberdeen University Library. The initials of the builder and master mason, Thomas Lepier, can be seen on the outer wall on one of the skew stones of the cap house. 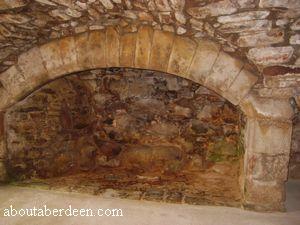 The basement room was a cold room and would have been the Lairds wine cellar. The extreme right side of the castle was known as the West Range and would have held accommodation for guests, a brewhouse and gallery on the first floor. The gallery would have displayed the family portraits and pictures. Directions to get to Tolquhon Castle from Aberdeen: This route should take you about 40 minutes and the journey is about 20 miles. From Union Street in Aberdeen City head down to King Street and follow this road keeping straight past the roundabouts. Keep following the signs for Peterhead and Fraserburgh and stay on the A90. Go past Foveran and take the left exit of the B9005 into Ellon. Before entering the town of Ellon turn left into Riverside Road. This is now the A920. Head towards Pitmedden and Oldmeldrum. At the crossroads turn right onto the B999 and head to Tarves. You should now look out for the brown Historic Scotland road sign for Tolquhon Road on the left. There is a short drive on a narrow road with some passing places. 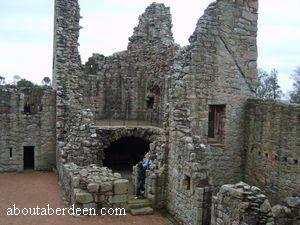 There is a large free car park and Tolquhon Castle is a short walk away. The castle itself is not suitable for wheelchair users or those who find stairs difficult to climb. Though wheelchairs, buggies and prams etc can access the main grounds and into the castle courtyard. The National Trust for Scotland (NTS) own several well preserved paintings of Tolquhon Castle painted in the 19th century which picture the castle when it was occupied. These include pictures by the artist James Giles in 1838 and 1857. 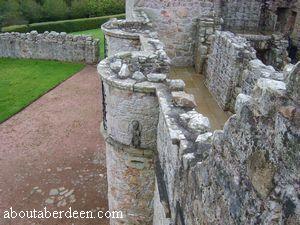 Read more in the book Tolquhon Castle by authors W. Douglas Simpson and Christopher J Tabraham. 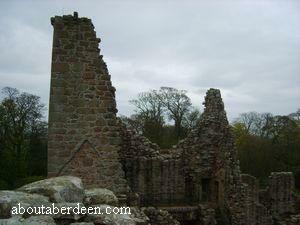 We are not sure if Tolquhon Castle is haunted but have had no reports of ghosts or hauntings. It is certainly a peaceful area and a beautiful castle.